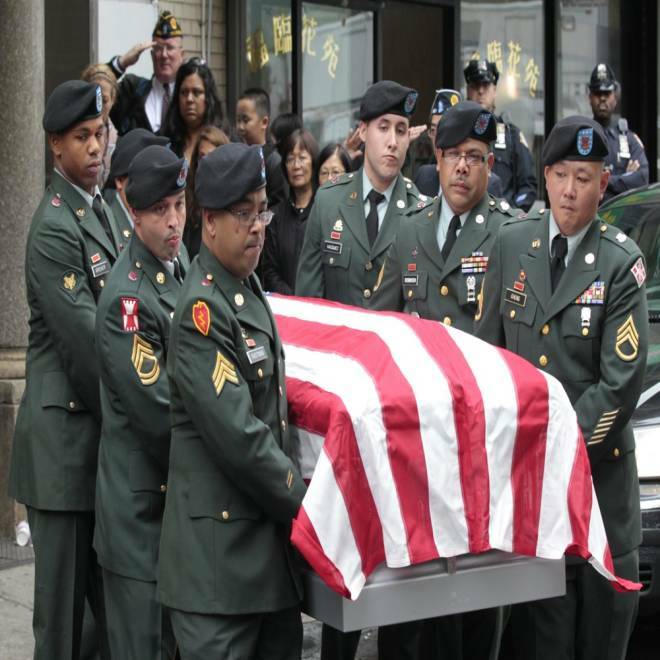 Soldiers carry the casket of U.S. Army Pvt. Danny Chen for his funeral procession in New York in this Oct. 13 file photo. Army prosecutors will be in a tough spot pursuing charges of negligent homicide and involuntary manslaughter against five soldiers in connection with the death of an Asian-American GI whose family and advocates say was the victim of racial taunting, bullying and hazing, according to military law experts. Pvt. Danny Chen, 19, of New York, was found dead in a guard tower in southern Afghanistan from an apparent self-inflicted gunshot on Oct. 3, according to Army investigators. Eight soldiers, including an officer, were charged Wednesday in connection with Chen's death, and five were accused of the most serious charges -- involuntary manslaughter to negligent homicide. They “relate to conduct that occurred in the time leading up to his death,” Dave Connolly, chief public affairs officer for Regional Command South in Afghanistan, wrote in an email, declining to provide further detail. Chen, the son of immigrants from southern China, was not depressed but had suffered emotional and physical abuse in the military: He was dragged from his bed and made to crawl while rocks were thrown at his back and was forced to hold liquid in his mouth while doing chin-ups during his two months in Afghanistan, according to accounts from his family, who said they got the information from Army investigators. He also endured racial taunting, including having his last name said in a goat-like voice and other soldiers calling him Jackie Chan, while undergoing training in Georgia, according to letters he wrote to his family and diary entries, said Elizabeth OuYang, New York branch president of OCA, a national civil rights organization serving Asian Pacific Americans. At the time of his death, Chen had been in the military for seven months; he had deployed to Afghanistan in August. The negligent homicide and involuntary manslaughter charges in cases of hazing leading to suicide in the U.S. military appear to be a first, said Grover Baxley, a former member of the U.S. Air Force Judge Advocate General (JAG) Corps, and Hank Nuwer, who has done decades of research on hazing in schools and the military. “It’s interesting that they’re making -- as I see it -- a leap from hazing to being criminally responsible for a self-inflicted gunshot death,” said Baxley. He said that in similar cases where the government had gotten hazing convictions, prosecutors could argue in the sentencing phase that hazing was an aggravating factor contributing to death. “In the Army case, they've taken it a step further and they're actually charging them with criminal responsibility for … Private Chen’s death, and that’s a big distinction,” he said. Prosecutors still must present their evidence at an “Article 32” hearing – the equivalent of a grand jury in civilian law – after which an investigating officer will determine whether to sustain the charges. Negligent homicide is defined in military law as "the killing of another person through simple negligence," Baxley said. The US Legal website defines involuntary manslaughter as "manslaughter without any malice or intention," it said. Under the negligent homicide charge, the government must show that Chen’s death not only resulted from a negligent act by the soldiers but was the “proximate cause” of it, said Baxley, who now has a private practice, JAG Defense. Greg Rinckey, a former attorney with the U.S. Army JAG Corps, said he agreed with that assessment and noted that the defense would likely try to find evidence, for example, that Chen was fragile, had previously been suicidal or didn’t want to deploy. “They’re going to look at all these things to try and shift the blame from these soldiers are the proximate cause as to, ‘No, the proximate cause was he was predisposed really to suicide,’” he said. The most serious charges also could be a way of trying to pressure one or more of the defendants into cooperating with prosecutors in exchange for lesser charges or immunity, Rinckey said. Little is known about the Army's case at this point, but prosecutors "might have a hard time proving this. What could very well happen in a case like this is there could be a plea,” said Rinckey, managing partner of Tully Rinckey PLLC. “It’s the first person that comes forward is usually the one that gets the sweetest deal,” he added. A combination of factors – racial, political, a military superior focused on ending hazing – could have also led the Army to impose the rare charges, said Nuwer, an author of several books on the issue. The soldiers at Combat Outpost Palace in the Panjwa'i district of Kandahar province, where Chen was stationed, may have been trying to push him out of the service or giving him the chance to change his behavior, he said. The military has a "zero-tolerance" policy of hazing, but it still happens, experts say. One recent case was that of Lance Cpl. Harry Lew, who was hazed by fellow Marines, according to a U.S. military report on his April 3 death. The military accused three Marines of beating Lew hours before he killed himself and charged them with hazing. They face court martial, The San Jose Mercury News reported. After a Wednesday morning press conference held in New York by Chen’s family and Asian-American advocates, a senior Pentagon official offered condolences to the soldier’s relatives. Chen's family and advocates are not convinced that his death was a suicide, despite the initial finding that he died of a self-inflicted gunshot wound, and have asked forensic expert Henry Lee to conduct an independent autopsy. Chen's mother, Su Zhen, 49, said she had not wanted her only child to join the Army and at the press conference said she “could not figure out why they (the soldiers) would do this to him." OuYang, of the OCA, said her organization does not want the defendants to be allowed to plea bargain. "It's one thing to charge them with high charges, but it means nothing if they plea bargain to something very low," she said. "... If they are responsible for his death they need to be charged and found guilty of that."